CH & I had our June camping weekend this weekend. We left on Friday after dinner since we went to a state park that is just north of Knoxville. We didn't want to get stuck in traffic, so we ate an early supper at home, then got on the road. It was actually a little bit of a bummer weekend. When we think "State Park", we think woods and walking trails, and a river or lake. Especially since the name of the park has "Lake" in it. We made the best of it, though. It turned out really well...even the bottom of the bread wasn't burned! The recipe calls for sausage, onion, and green pepper, and a frozen bread loaf. I got the already cooked turkey sausage and forgot about the onion & green pepper. Kroger has a frozen package with all of that already in it, but I had a brain fart when I went to the store & didn't get it. And, I forgot a rolling pin, so I had to use a cup to roll out the dough, so it didn't get rolled out thin enough. If we make it again (and I think we probably will), I'll use the french loaf in a can so the dough will be thin. 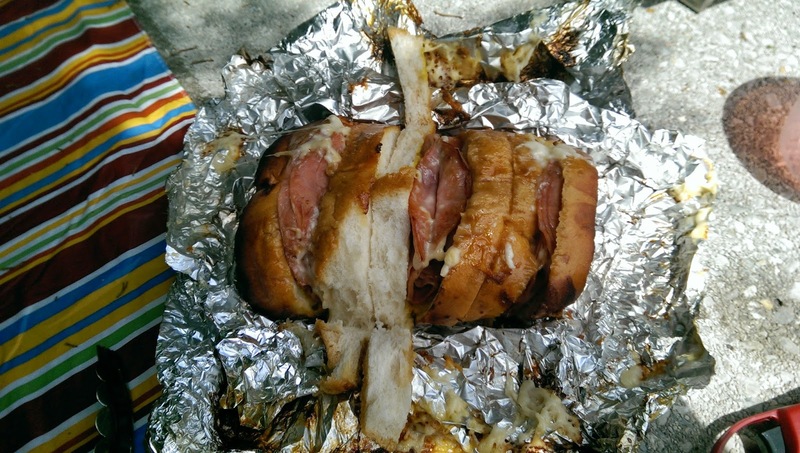 I had also found a recipe for Grilled Ham & Cheese Pull Apart Sandwich Loaf. As you can see, I didn't spray all of the foil as much as I should have, and part of the loaf was burned. The recipe says to put in on the grill for 20-25 minutes; I think 10-15 would have been enough. The part that wasn't burned was good, though, and Laika liked the burned part! It rained off & on on Saturday, so CH caught up on some sleep, and I finished another book. 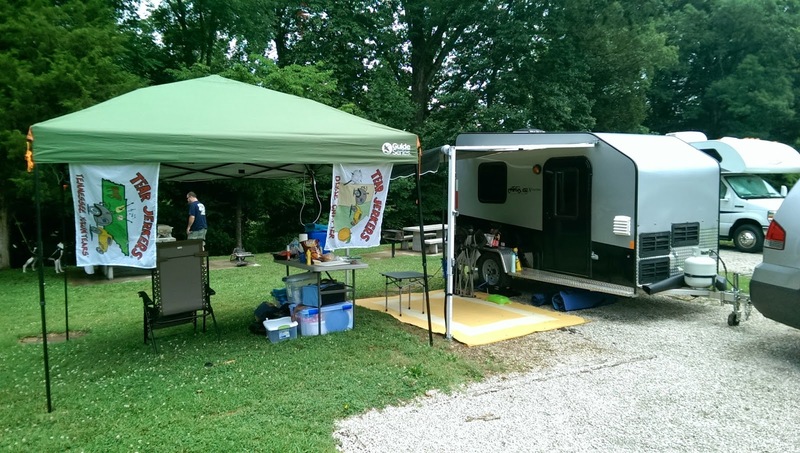 I love to hear the rain on the easy-up/awning/camper. It's so peaceful. Since there was 4G at the campground, we were able to use the hotspot to watch the rest of "Longmire" on Netflix. On Sunday, after we got home, we switched over to "On Demand" and got the rest of the way caught up! New episode tonight! Hope you were able to get outside over the weekend. I copied that recipe of Lea's ... it sounds so yummy ... how awesome that you were able to convert it to the campfire. Saw YS at work on Saturday. I asked about you and he said you were camping, but he had no idea where. Sorry it was all you hoped, but it sounds like it wasn't too bad. I saw that recipe on CiCi's. It looks delicious. Oh, Mary! It looks so delicious! Camping is not my thing, but that recipe does sound good! Glad you had some down time! We like Longmire, too! Cooking while camping has it's challenges (which is why I usually leave it up to my friends!) but it looks like you've come up with some good stuff. Are you camping for the 4th, too? I remember going on camping trips as a child.